Darts and billiards are among the most popular games in the world for a reason. People have these games in their rec rooms in the basement. Bartenders have them at their establishments. Amusement parks have them. These are games that are open to everyone and that people can play without too much exertion and regardless of body type. These are also great social games that can really bring people together, and they can be right at home in a community league and as a community pastime. Who Should Play Darts and Billiards? Darts and billiards really can be played by anyone. Some people still have some negative perceptions of darts and billiards because of their association with bars. However, there is nothing inherently adult or inherently family unfriendly about darts and billiards. Children could play them. Safety might be an issue with darts and children, of course, but this should not be a problem when it comes to billiards. Darts and billiards work well when it comes to co-ed teams. These are also games that manage to cross all age boundaries. It doesn’t take a high degree of physical fitness to play games like these, which require hand-eye coordination and a degree of arm strength and no running. One of the benefits of darts and billiards is that they are versatile. They can be played as individual sports, but they can also be played as team sports. People can truly get the best of both worlds with them. Darts are fairly simple. People grip the individual darts, throw them and aim that at particular targets in order to score points. The complications come with the point values of different targets and the distance at which people are supposed to stand from the dart board. People should generally be around seven feet and nine inches from the target of the darts, which is called the bullseye. The bullseye needs to be five feet and eight inches off of the ground. People need a bullseye and a set of darts to play and something to mark the toe line, and that’s all. Darts and billiards are almost entirely games that rely on hand-eye coordination. Anything that people can do in order to improve their hand-eye coordination is going to help. People might need to work on their ability to stand for long periods of time, but other than that, people only need to concentrate on their upper bodies. Billiards require a stance that can be tiring for the back, and it might be a good idea to do some back stretches in preparation for them. Other than that, people specifically need to focus on improving hand-eye coordination. 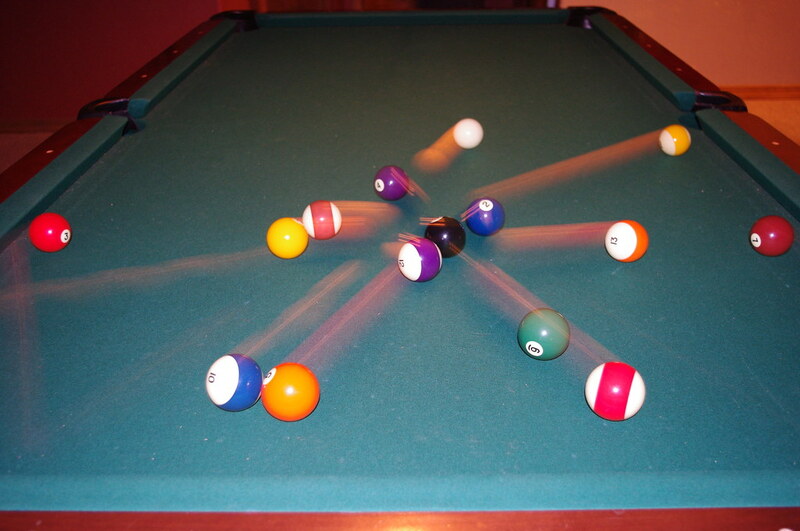 Players are essentially trying to knock the billiard balls into the pockets of the billiards table using their cues, which are the pool playing sticks. People have to strike their cue balls. Players will score points by striking the cue balls and knocking other balls into the corner pockets. They also have to avoid knocking their cue balls into the corner pockets, which is where part of the challenge emerges. As more and more adults look to get involved in a variety of physical fitness related endeavors, various nontraditional sports are making a come back on an organized and recreational level. This allows people to get out and about in the community, meet new friends and neighbors, and have a great and fun experience all at the same time. The city has an entire adult recreation department now devoted to providing adults with the type of sports activities that meet their skill level, all the while meeting their demand for good, healthy competition. The rules for the sport are relatively simple, and people of various athletic ability and easily find their place on the team. One such sport that is growing in popularity is broom ball. What the Heck is Broomball? Quite simply, broomball is a sport that looks and feels like hockey, but without the need for all that physical contact. 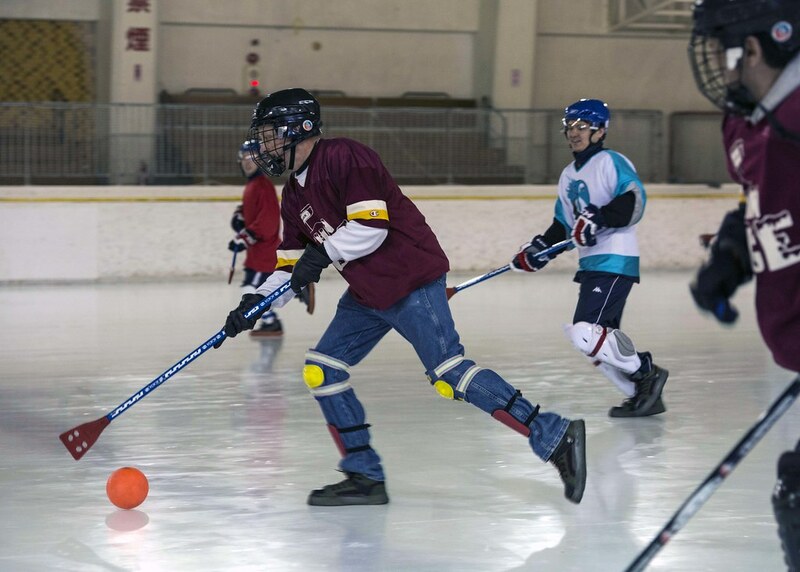 Hockey is not a sport that the masses can play due to its physical nature, but anyone who can skate on ice is a contender to join in on the fun of broom ball. It is currently growing in popularity in ice arenas around the country. While the sport is generally played in the winter, indoor ice rinks make it possible to play even in the summer months. In fact, some recreations leagues prefer this as many adults enjoy the escape from the heat for a few hours. The game itself has similar rules to that of hockey. There are two teams with an equal number of players on each side. Most leagues will cap this at 25. The main object of the game is to make it to the other side of the rink and score more goals than the other team. each player uses a stick that is similar to a broom handle, hence the name of the game. The bay is six inches in diameter and it designed to move easily up and down the ice. One unique distinguishing facet of broom ball in comparison to hockey is that skates are not involved. Players simply wear norm tennis shoes on the ice. This makes the game even more accessible, as knowing how to skate on ice is not a prerequisite to being able to play. As a result, adults of all ability levels can enjoy the game and that is why it is beginning to grow in popularity. There are many misconceptions about broom ball floating around out there, so let us quickly dispel those here. Many people mistakenly believe that broom ball is played on grass. It is not. Ice is a requirement to play the sport, and it is generally played on a hockey rink. There are other hockey style sports played on grass, but broom ball is not one of them. Others have a picture of broom ball as using stones that are used to try to knock other stones out of a circle. That is actually the sport of curling, which is another fun sport, but broom ball is definitely played in a style very similar to hockey. The only difference there is that a ball is used instead of a puck. Badminton is a game that manages to be both social and competitive, which is going to make it very appealing for a lot of people. This is a game that either involves small teams or individuals. Badminton is very similar to tennis, although a lot of people think that it is easier to serve a shuttlecock than a tennis ball. Badmitton rackets are also much thinner and lighter than tennis rackets, which can make the sport more accessible to lots of people. 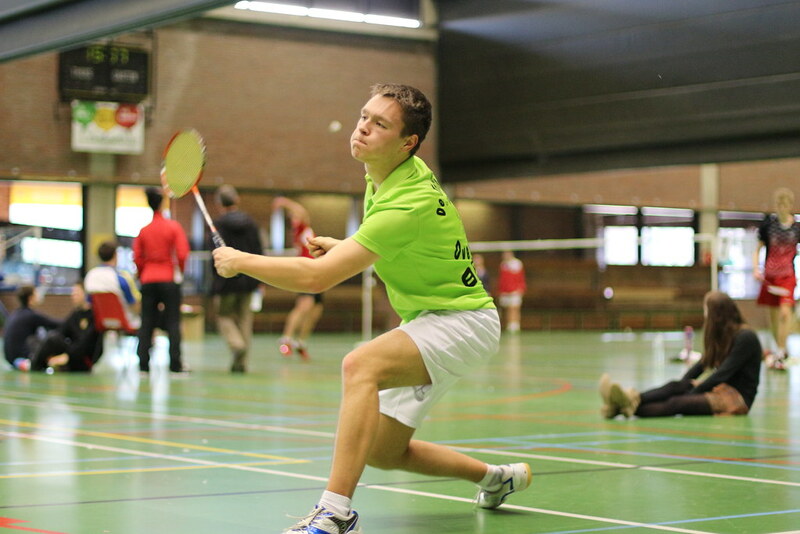 However, badminton provides the same opportunities for entertaining exercise as tennis. It can be relaxing or challenging, depending on how people want to organize the game. One of the joys of badminton is that it is truly a game that almost everyone should be able to play. It lends itself well to co-ed teams, very much in the manner of tennis. In terms of fitness level or skill level, badminton is a sport that can be used to raise a person’s fitness level or skill level, and it doesn’t require people to be in peak physical condition initially. If people can run across short distances for the brief bursts required in badminton and they can swing a badminton racket, they should at least be able to get started. At the competitive level, it should be possible to organize beginner’s leagues and leagues for people who are more proficient. Badminton is either played by teams of two against teams of two, which is called doubles badminton, or it is a matter of individual players competing against one another. As such, it can be organized as a team sport or an individual sport. The shuttlecock for badminton is very lightweight, and it does not require a great deal of strength in order to pass it or hit it. As such, very young people should be able to play it. Badminton is commonly taught in middle school gym classes. The net for badminton might be slightly too high for very young children to use comfortable, but kids who have reached their preteen years should be able to play badminton successfully. The equipment necessary for badminton is simple and generally inexpensive: people are going to need a shuttlecock, badminton rackets for each player, and a badminton net. A badminton game is made up of different rallies, which are more or less marked by people serving the shuttlecock over the net. The rally will have two main results: the shuttlecock hits the floor or ground or the net catches it. In some cases, players will commit a fault. The side that wins a rally gets a point. It takes twenty-one points in order to win a badminton match. As with all sports, training specific muscle groups can help people improve. In the case of badminton, toning the hamstrings can lead to a better stance. Toning the muscles of the forearms can give people more control and force during each and every shot. Strengthening the back muscles can allow people to avoid experiencing aching backs as a result of playing badminton all day, which can be a problem. Kickball is not a sport only for children. Adults love playing kickball just as much. Our local city Adult recreation department wants to get as many participants involved as possible in playing the sports that we all love. Are you interested in playing adult kickball? Let’s dive right in and explore it some more. Kickball is increasing in popularity with adults. The site, AthelticBusiness.com wrote an article on the growing popularity of adult kickball. Basically stating, kickball is a social event where adults can go out and have hours of fun with their peers. Although, adult kickball is different than playing kickball in gym class as a child. There are more rules than there was back then. The adults playing kickball like the rules. It allows them to play a fun, social, and entertaining game that is competitive. Plus, they don’t have to worry about the harm and excessive bodily injury that comes along with playing other competitive adult sports such as co-ed softball. This makes sense and this is extremely significant as to why more people are participating. Who Should Play Adult Kickball? Are you considering joining your local adult kickball team? It’s a great idea. Kickball is a co-ed game, where just about anybody can play. Meaning you don’t need any real skill to play kickball. We have all enjoyed the game as a child and know the basics. People who enjoyed playing kickball as a child seem to be the one’s that are really taking an interest. That being said, it’s people in their thirties and forties who are jumping right in to join the local kickball team. Don’t let that age limit defer you from playing, there have been people in their seventies taking an active interest in kickball too. Are you wondering what the adult rules are compared to playing kickball as a child? Well, look no further. Here is a short overview of the basic rules of adult kickball. The information is from a credited source, www.kickball.com owned and operated by WAKA. WAKA is the World Adult Kickball Association. If you want to get extremely competitive and completely official, check it out. Here are the basic rules. In the game, there are 2 teams that compete against one another, a playing area, bases, and a ball to kick. Just as in other sports such as baseball or softball. The main objective is to score as many runs in as possible. You want to score more runs than the opposing team. Simple, right? Each team has 11 players, including a catcher and a pitcher. There are 5 innings per game. Two base coaches are allowed. A batting line-up must be submitted to the referees before play begins. In the case, the kicking line-up. Bouncies are allowed if the player kicks the ball. This means if a pitcher throws a bouncing ball to the kicker and they kick at it, it counts. If they don’t kick, it will automatically be a re-do. NO head shots are allowed. NO fighting are profane language is allowed. One base allowed per overthrow. No ghost men allowed, the kicker must run. Here are 3 tips to help you play better and improve your kickball game. These tips were suggested by kickballstrategies.com. If you would like even more strategies to improve, check it out. Be sure to stretch and warm up before a game. Especially, if you are older. You don’t want to be all stiff and sore. Never hold the ball. Runners will keep running until the ball is back to the pitcher. If bases are full. Kick the ball to first. Chances are you will get out but, you will help to score a run in. 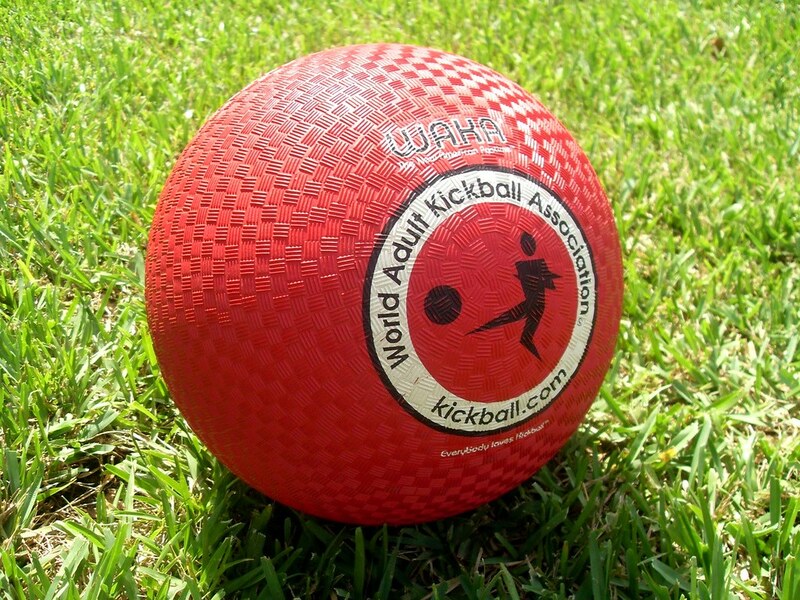 If you want to get active and be social with other adults, then kickball is a great choice. It’s a sport that you can make as competitive as you want. There are rules to follow and it’s not rough as many other adult sports. Adult kickball is rising in popularity. Chances are there is a kickball team or league near you. Get Fit Sports Blog at WordPress.com.